These things are usually said with very good intentions and meant as encouragement, but I feel like it’s important that Christians spread biblical encouragement. A version of this piece originally appeared on mascaraandgrace.com. Published with permission. If you’ve been a Christian for any significant amount of time, then you may have noticed some things that fellow Christians say that aren’t exactly in the Bible. These things are usually said with very good intentions and meant as encouragement, but I feel like it’s important that Christians spread biblical encouragement. I’m well aware that this post may ruffle some feathers, so I’m praying that this can be received with open hearts and minds. Please understand that I’m not here to shame or condemn, just simply to educate. 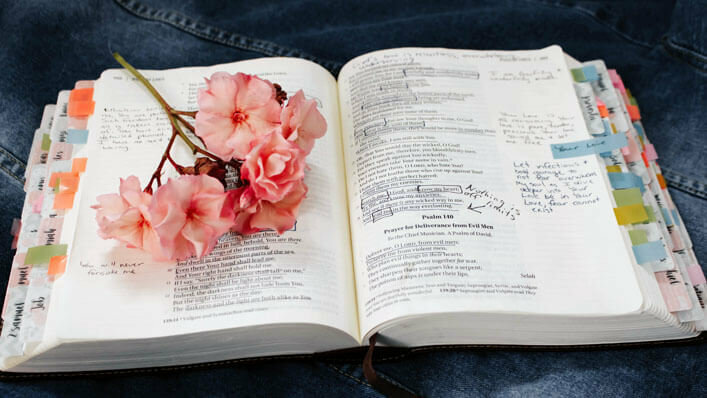 Let’s get into these 5 things Christians say that aren’t actually in the Bible. I’m not saying that God wants us to be miserable, but God’s ultimate goal for us is to be holy. And this particular saying is dangerous because it’s often used to justify sin. I most often see this used when it comes to justifying divorce. There are biblical grounds for divorce, but it’s common to see “God doesn’t want you to be unhappy, so if you’re unhappy in your marriage then you should leave”. Of course, being happy is healthy for you and not a bad thing, but holiness cannot be sacrificed for happiness. As a Christian, it’s important that you hold up every thought you have and everything you do to the Scriptures. Your heart, while good does come from it, is ultimately affected by sin and will lead you astray. There are lots of verses about the heart in the Bible actually, but none of them tell you to follow it. It tells us to be pure in heart, to guard our hearts, that our hearts can be troubled, and that God is the true strength of our hearts. 3. God gives his toughest battles to his strongest soldiers. People often say this to provide comfort to others during times of trial, but there is no hierarchy. God is not looking upon us and judging us based off our strengths, because our strength comes from Him alone. As His children, we all have equal “access” to His strength to overcome sin and to strive for holiness. 4. God never gives you more than you can handle. When you study what is in the Bible, this is proven to be entirely untrue. There are many examples in the Bible of people who were given much more than they could handle, but they got through it because they focused on God. God desires for us to draw near to Him, and being given more than we can handle gives us that opportunity. 5. We’re all God’s children. What they should be saying is that we’re all created by God, which is true, but God is a relational being. Being God’s child requires an intimate and personal relationship with God. Until we accept and repent of our depravity, we are just one of His creations. Maybe Your Parents' Faith Is More Graceful Than You Thought? Kalyn Foggy is a 27 year old wife and mother, residing in Phoenix, Arizona. She enjoys long walks up the makeup aisles, working out, and Twitter. Her true passion is helping moms fumble through makeup and encouraging them through Christ on her site, mascaraandgrace.com.